A specially formulated bag and block product designed to help meet the salt and trace element requirements of most livestock. Trace minerals complement the diet to help promote digestion, growth, maintenance of body tissues, proper reproductive processes, and general animal well-being. This salt product is intended for beef cattle, dairy cows, horses, goats and pigs. Trace mineral salt licks, in the form of blocks, are weather resistant for free choice feeding. Salt, Zinc Oxide, Iron Carbonate, Calcium Carbonate, Manganous Oxide, Red Iron Oxide, Copper Sulfate, Mineral Oil, Calcium Iodate, Cobalt Carbonate, and Anise Flavor. 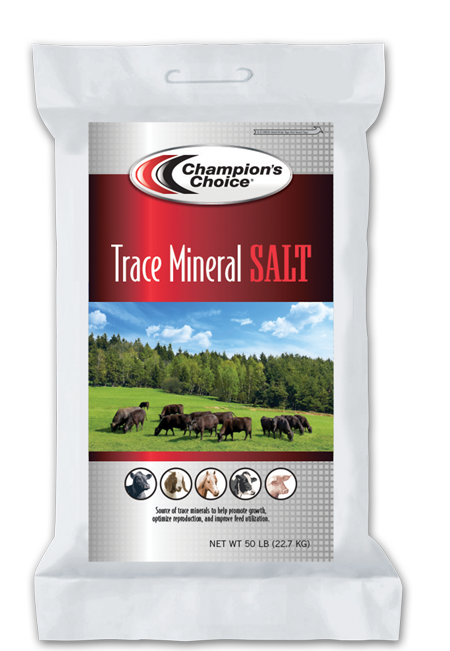 Why feed trace minerals with salt to animals? Salt is one of the few minerals that animals will seek out in their natural environment. There are seven trace minerals essential in feed: iron, copper, zinc, manganese, cobalt, iodine, and selenium. 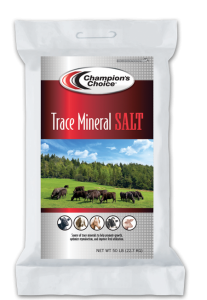 Since livestock have a natural appetite for salt, but not for trace minerals, this makes salt an ideal medium to deliver these vital minerals. What are the symptoms of copper mineral deficiency in animals?